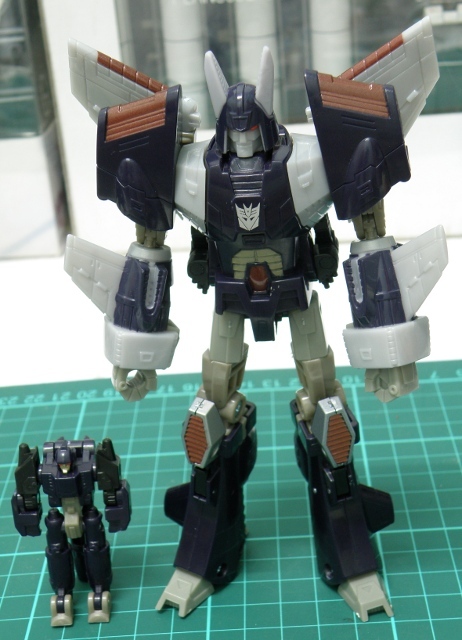 Transformers Classic Voyager Class Cyclonus, Gimmicks [Part4] | Out of the box. Cyclonus do not has a lot of accessories. The only gimmick is nightstick aka its gun/blaster. The lack of accessories is forgivable, NightStick on its own is an interesting piece of gun. The posebility of NightStick is limited to its arm, elbow and leg minus its knee. 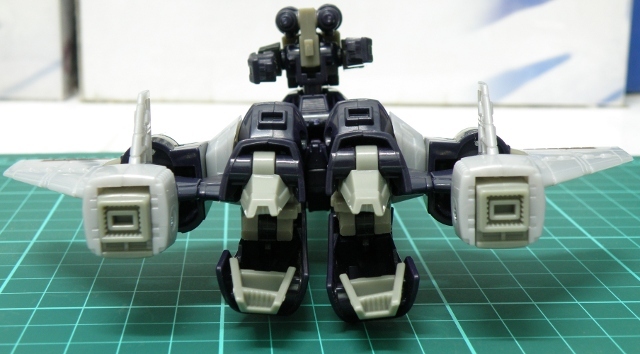 It is too bad that the gun barrel too long, it may becomes the 3rd leg for NightStick. If the barrel is collapsable the robot mode of NightStick would be perfect. 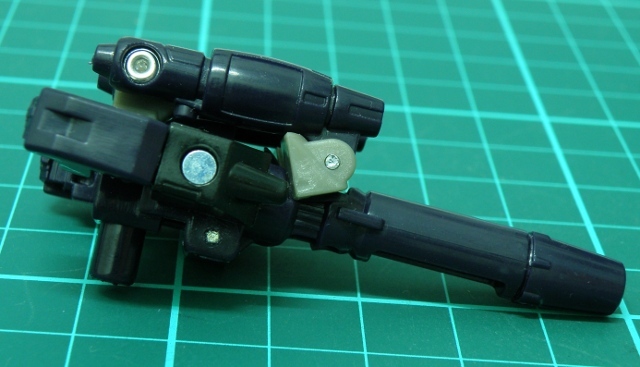 The transformation of NightStick from robot to gun is very straight forward that you need no instruction on the transformation process. Once it is transformed it becomes a big gun. NightStick gun mode view from side. 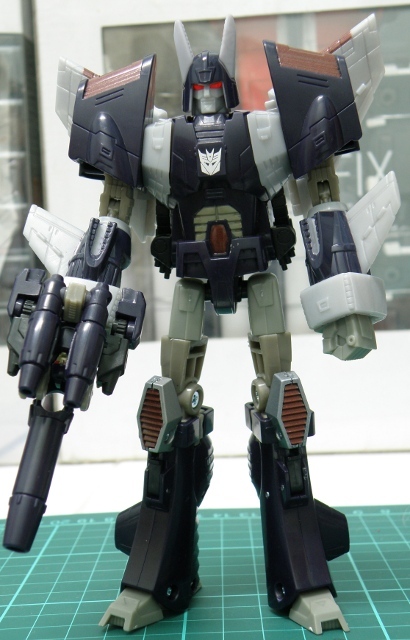 NightStick on gun mode can be attached to Cyclonus cybertronian jet just above the cockpit/cabin. 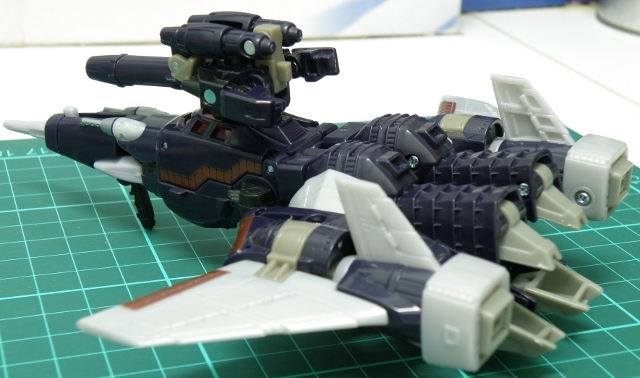 Cyclonus cybertronian jet with gun attached. 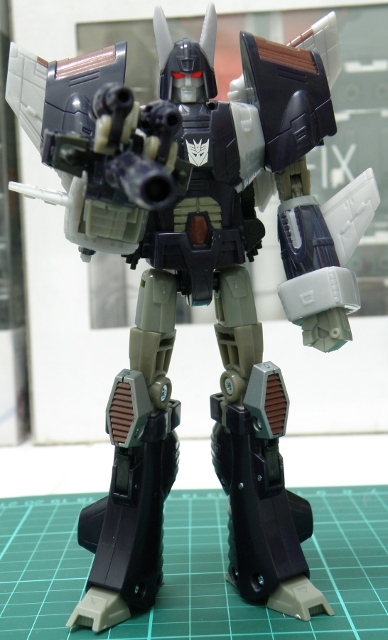 Cyclonus cybertronian jet mode with nightstick attached. 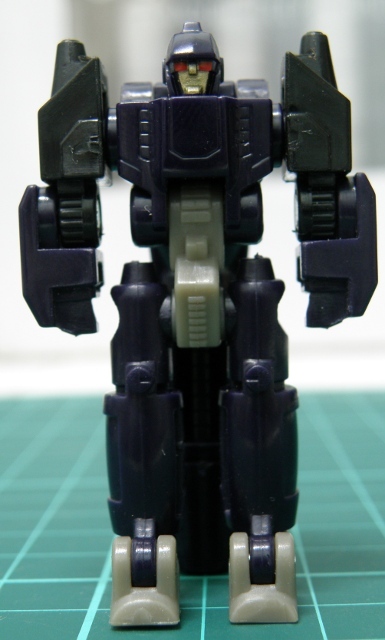 Cyclonus cybertronian jet mode with nightstick attached back view. 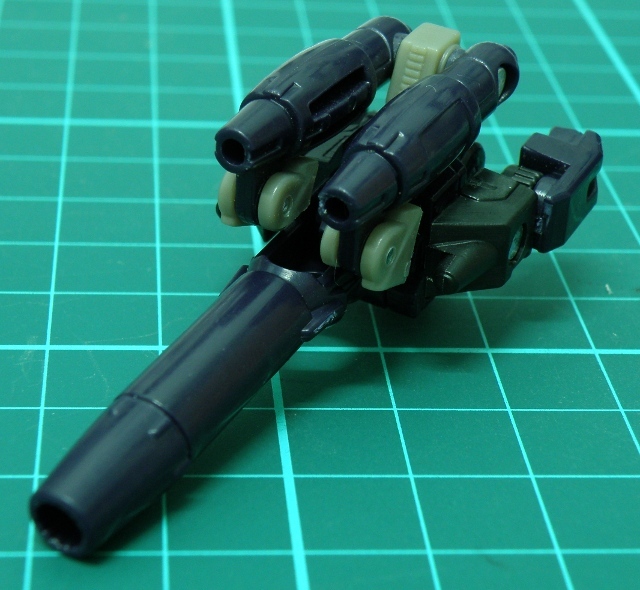 NightStick can only be hold by Cyclonus on its right hand, which is very unfortunate. You can’t help but imagine that Cyclonus whenever he wants to shoot his gun/blaster, he might say “Say hello to my little friend.” . 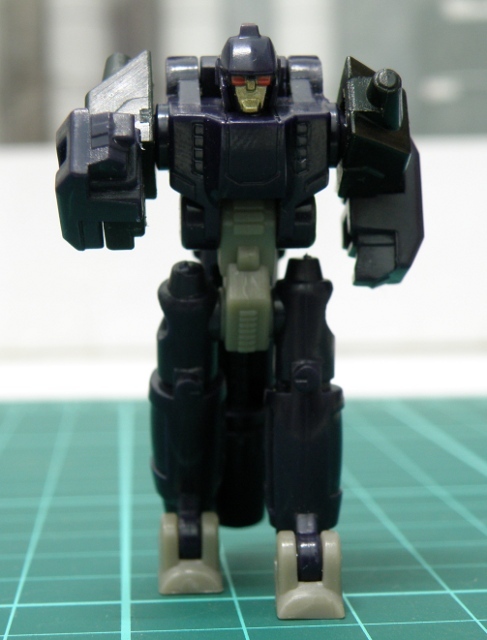 Cyclonus holding NightStick at ease. 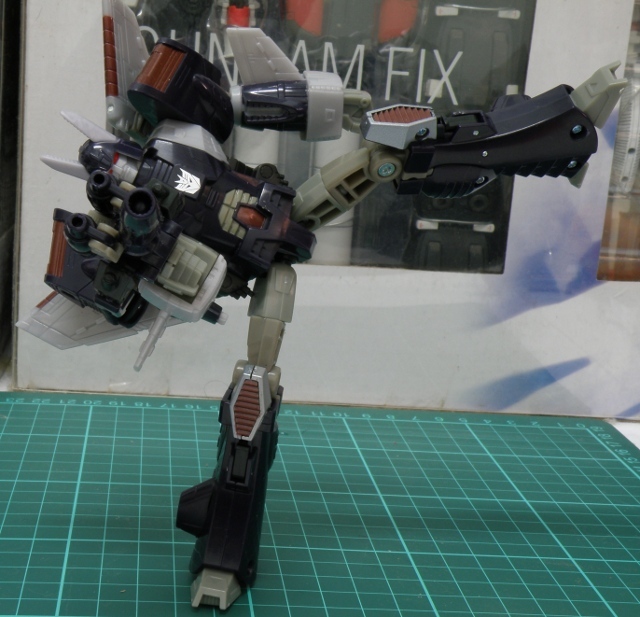 The articulation overall is good, but the waist unable to twist and the arms is articulation is limited due to the wings is blocking the full articulation potential. However, the torso connection to the legs is ball point there is fear of the ball joint loose after long play. In the nutshell, the articulation of Cyclonus is good but not excellent. You don't mess with the Cyclonus. As a summary on this toy, it shines its best in robot mode. Cybertronian jet mode is abit floppy at the lower part of the Cybertronian jet. It sleekness on its robot mode and its pal NightStick offset the small flaw in the Cybertronian jet mode. It is a very good attempt by Hasbro and TakaraTomy to remake the toy with better accuracy to the G1 Transformers character. This entry was posted in Mecha, My Hobbies, Transformers and tagged armament, articulation, cyclonus, Decepticon, Deluxe Class, Destron, Generation 1, Generation1, gimmick, hasbro, hasbro transformers, henkei, night stick, nightstick, review, review summary, robot, robot mode, takara, takara tomy, takaratomy, target master, targetmaster, transformer, Transformers, transformers classic, Transformers Universe, Voyager Class by KarMeng. Bookmark the permalink.